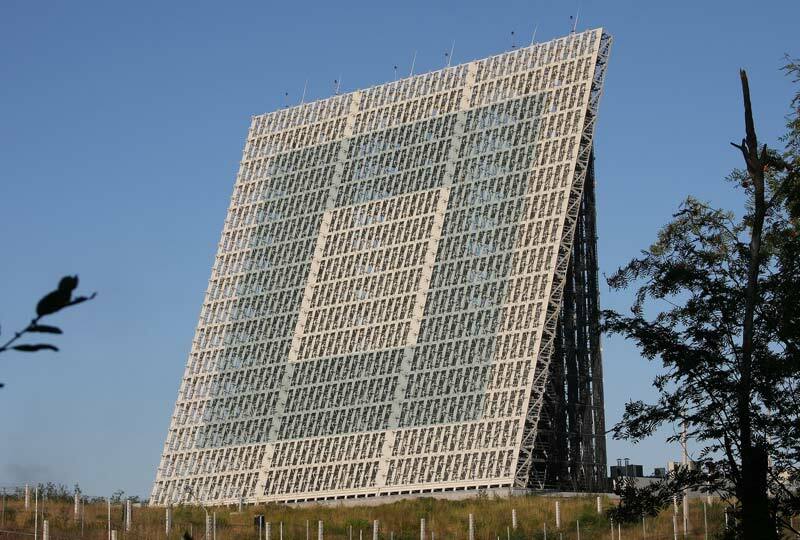 The radar station 77YA6 «Voronezh-M» is a newer Russian early warning radar in the Leningrad area operating in VHF band. The first field tests started in March 2007, the commissioning from 11 February 2012. The radar uses a planar phased array antenna. It covers in the azimuth from 245 to 355 degrees, and in the elevation from 2 to 70 degrees. The maximum unambiguous range is 4 200 km, which corresponds to a sector ranging from Morocco to Spitzbergen. The radars “blind range” is 100 km, and the maximum target altitude is about 4 000 km. As possible targets are called ballistic missiles and aerodynamic cruise missiles. Because of the extreme climatic conditions in the winter in the Leningrad area, the entire antenna field can be heated in order to avoid a change in the antenna parameters due to snow deposits.